The left figure shows the block diagram of the optical single-sideband modulator. It contains ring modulators, multi-mode interferometers, and a 30-GHz quadrature hybrid coupler. The right figure shows a photograph of the modulator produced with IHP's photonic BiCMOS technology. Silicon (Si) photonics is a disruptive technology that provides photonic integrated circuit solutions for various demanding applications. The powerful Si integrated circuit fabrication technology for the implementation of photonic devices is applied to realize higher-performance photonic circuits and systems, which has larger degree of integration and higher cost-effectiveness with discrete photonic devices and/or III-V semiconductor technology. Furthermore, the same Si platform and fabrication steps can be used for the implementation of new hardware configurations that contain both photonic and electronic components on a single Si chip. In a paper published in Photonics Research, Volume 6, No. 1, 2017 (B.-M. Yu et al., Single-chip Si optical single-sideband modulator), researchers from Yonsei University in South Korea and the Innovations for High Performance Microelectronics (IHP) in Germany demonstrated the possibilities of photonic and electronic integration technology. 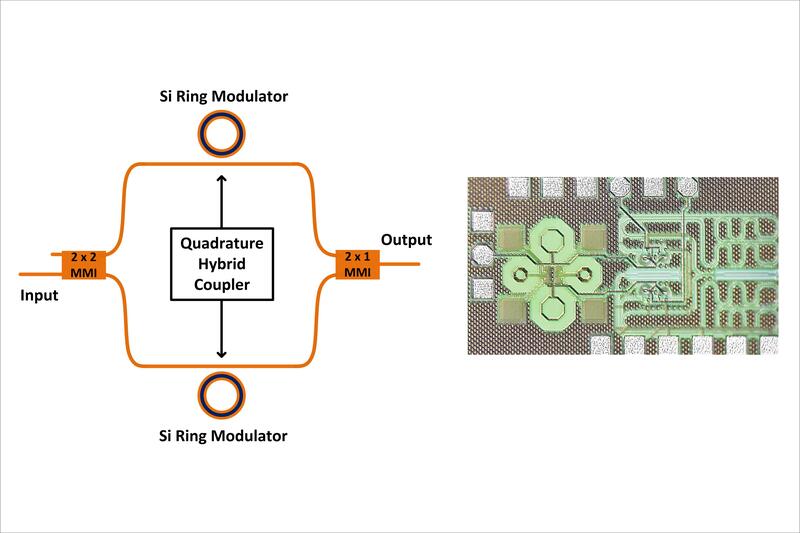 They successfully developed a monolithic Si optical single-sideband (OSSB) modulator operating at 30 GHz. Unlike conventional optical modulators that produce double sidebands, an OSSB modulator produces only one sideband, and it is a key component for radio-over-fiber technology. When the high-frequency electrical signals are transmitted in the optical domain over the fiber, the degradations due to the loss and the interference of many demanding wireless applications can be avoided. In order to realize the OSSB modulator, signal-processing both in the electrical and the optical domains is required. Up until now, this has been performed by separate electrical and optical components, which makes the resulting OSSB modulator device bulky and expensive. Using IHP’s photonic BiCMOS fabrication technology to produce high-performance monolithic Si photonic devices as well as BiCMOS circuits on the same wafer, researchers at Yonsei University and IHP incorporated all required electrical and optical signal-processing functions into a single Si chip. The resulting OSSB modulator achieves high performance, small size, and improved cost-effectiveness. To summarize, a function that conventionally requires a whole ensemble of instruments has been successfully realized with a single Si chip.